Description: The dollhouse the set the standard for all other dollhouses! 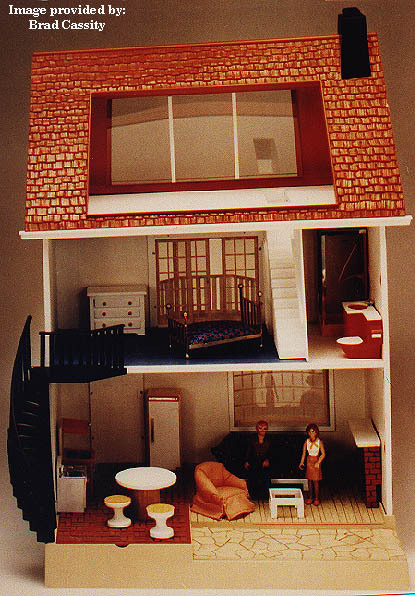 17" x 13" x 15" tall (without the removable orange roof) bluish-gray, 3-story dollhouse has 5 rooms. 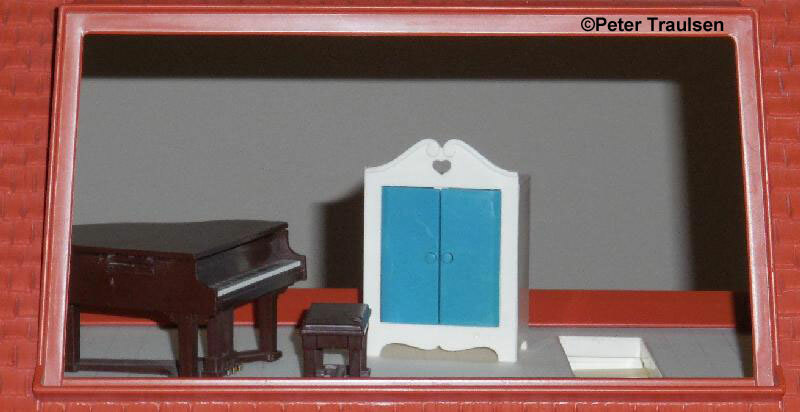 This is one of a series of 3 houses made for older children to house regular dollhouse people and furniture (slightly larger than the scale of the Adventure People line - nothing like the Little People sets). 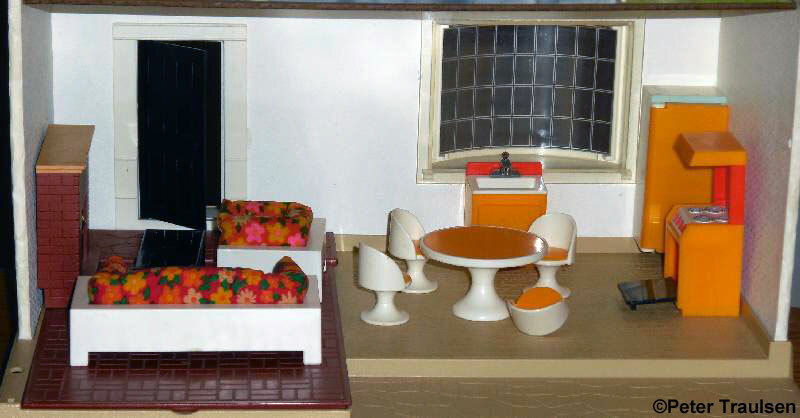 The second version of this house (#280 Doll House with Lights) had battery operated lights. There were curtain rods for the windows on the ground floor and the second floor. The house has real wood floors, simulated carpet, and tile on the bathroom floor. Sliding plastic French-style doors, bay window, picture window, and a simulated slate patio are some of the many features that made this house so realistic and cherished by those who own it. FPT1955 - Tan plastic rectangular dollhouse Foundation/Base with simulated wood plank flooring and simulated stone patio features. Overall size: 15-1/2" wide x 13" long x 2" tall. This base does NOT have provision for the retaining straps as do the #280/4300/4400 bases. Also, this base has a parts storage compartment where the #280/4400 bases have a battery compartment. Finally, the #250 base has a small round hole for the staircase anchor, whereas the early #280 base has a round "twist-lock" hole and the late #280-up bases have a rectangular slot. FPT5064 - Brown plastic rectangular simulated tile kitchen floor that fits over the parts storage compartment on the foundation described above. Measures 10-1/2" long, 5-7/8" wide, 1/4" thick. This piece also fits the #4300 doll house. This does not fit the #280 or #4400 lighted doll houses because they require a small opening for the on-off switch. FPT5065 - 1-piece wall unit that folds into three sections and has grey simulated siding. Measures 30" wide, 13-1/2" tall, 1/4" thick. This wall can also be used with #280, #4300, & #4400 dollhouses. FPT5066 - Grey traingle-shaped wall extensions pieces that form the tops of the side walls; Left Hand & Right Hand are the same. Overall size: 7-1/2" wide x 6-1/2" tall x 1/4" thick. Note: can be used with the #280 early (1-piece) wall unit, but siding pattern is different. FPT2043 - White outside door frame that has a small door bell (non-functional) molded on the side. Measures 3" wide, 5-7/8" tall, 7/8" deep. This door frame was also fits with #280, #4300, and #4400 doll houses. FPT2047 - White inside door frame. Measures 3" wide, 4-3/4" tall, 1/2" deep. This door frame was also fits with #280, #4300, and #4400 doll houses. FPT5067 - Black plastic front door with 6 panel designs. Measures 1-7/8" wide, 4-3/8" tall, 1/8" thick. This door is interchangable with #280, #4300, & #4400 dollhouses, but only the #250 is suppose to have a black door. FPT5077 - White plastic outside window frame for lower level bay window. Overall size: 5" wide x 3-3/4" tall x 1-1/8" deep. This frame also fits the #280 doll house. FPT5076 - Clear plastic lower level bay window. Measures 5" wide, 4" tall, 1-1/4" deep. Also fits the #280 doll house. FPT5068 - 2nd story masonite (wood) floor with a blue "carpet" and greenish-white "tile" floor litho. Measures 15" long, 7-1/4" wide, 1/4" thick. This floor can be used on the #280 but it does not have a slot for the ceiling light as the #280 2nd level floor should have. This floor is not interchangable with the #4300 or #4400 doll houses because they have a different stairway hole. FPT5078 - White plastic 2nd story balcony and window frame. This piece has an attached rounded balcony and railing. The sides of the window have white shutters. Measures 7-1/2" wide, 5" tall, 1-7/8" thick. This also fits the #280 doll house. FPT5087 - Clear plastic 2nd story double window with a missing center section for the "French" style door described below. This window fits within the FPT5078 2nd story balcony and window frame described above. Measures 6-1/4" wide, 4-1/2" tall, 1/2" deep. This also fits the #280 doll house. FPT5079 - Clear plastic sliding "French" style door. This fits within the FPT5087 2nd story window described above. Measures 4-1/4" tall, 1-3/4" wide, 1/2" deep. This also fits the #280 doll house. FPT2035 - White plastic rectangular 3rd story floor with an access hole that is along the narrow-axis of the floor. Measures 16-7/8" long, 8-3/4" wide, 7/8" thick. This also fits the #280 doll house. FPT5088 - Clear plastic rectangular garret window that fits over the big window on the front roof section. Measures 9-1/4" wide, 4-7/8" tall, 1/16" thick. This also fits the #280 doll house. This window will also fit the #4300 & #4400 doll house roof windows, but these houses were not sold with a window in the roof. FPT5069 - Orange-brown plastic shingle style FRONT roof section with a large window opening and an overhang. Overall size:16-1/2" wide x 8-1/2" tall x 1-1/8" thick. Note: This roof piece can be used on the #280, #4300, & #4400 Doll Houses, but the roof does not have slots for retaining straps. FPT5070 - Orange-brown plastic shingle style REAR roof section witha large window opening and no overhang. Overall size: 16-1/2" wide x 8-1/2" tall x 1-1/8" thick. FPT5089 - Black plastic double-vent chimney that fits on top of the roof pitch. Measures 3-1/8" tall, 2-1/8" wide, 1-1/4" deep. *See "Variations" below. FPT5071 - Small black plastic triangular shaped spiral stairway "stair unit" that makes up one step in the 15-step spiral stairway. It has a small peg on the bottom side, a slot hole on the top side, and a dowel peg on the end. Measures 2" long, 3/4" wide, 3/4" tall. FPT5072 - Black plastic handrail with upright rails that fit into the slots on the stairs described above. The top 2 and bottom 2 rails are longer than all of the other rails. The other rails are commonly broken. Measures 9-7/8" long, 1-1/4" tall, 1/8" thick. FPT5096 - Black plastic trapezoidal-shaped flat staircase landing/balcony. It has 5 slots in the outer edges, the top stair fits in one of the slots, and the balcony railing fits in the other slots. Measures 4-1/4" long, 3-1/8" wide, 1/2" thick. FPT5073 - Black plastic staircase landing/balcony railing. The railing fits into slots on the landing/balcont described above. Measures 4-1/4" long, 2-1/8" tall, 1/8" thick. This railing will interchange with the #280 doll house railing, but it is different colored than the railing that is suppose to be used on the #280. FPT5080 - White plastic staircase/wall with an arched doorway opening. This staircase connects between the 2nd and 3rd floor. Measures 7-1/8" wide, 6-3/8" tall, 1-1/4" deep. This also fits the #280 doll house. FPT4855 - Dad wearing a tan long-sleeve shirt, green pants, and brown hair. FPT1957 - Mom wearing a short sleeve light blue shirt, and a white skirt. FPT5041 - Small square wall paper sheet with a orange crackle with blue flowers design. Used to decorate the #250 Doll House walls. Overall size: 7" long x 6-1/2" wide. FPT5039 - Small square wall paper sheet with a white-and-gold vertical ribs/flower design. Used to decorate the #250 Doll House walls. Overall size: 7" long x 6-1/2" wide. FPT5040 - Small square wall paper sheet with a yellow and white checkerboard style/design. Used to decorate the #250 Doll House walls. Overall size: 7" long x -6-1/2" wide. FPT5138 - White cardboard sheet with various images of home furnishings that can be cut out with scissors and used to decorate the FP dollhouses. ID #219912, copyright 1978. Shows images of 2-mushroom pictures in frames, 2-butterfly pictures in frames, 4-record album covers, 1-large wall mirror in wooden frame, 1-arched mirror in a green frame, and1-yellow face wall clock. Pink border. FPT5137 - White cardboard sheet with various images of home furnishings that can be cut out with scissors and used to decorate the FP dollhouses. ID #219852, copyright 1978. Shows images of 1-wall calendar, 2-pictures in black frames, 1-seashell wall cabinet, 1-large wall painting of trees, 1-wall clock with pendulum, 1-square wall clock with tan face, 1-wooden cabinet with small spice bottles, 3-book covers, 2-pictures in yellow frames, and 1-large tapestry or decorative wall hanging. FPT5090 - The chimney was also available in white opposed to black.